Professor Abdilatif Abdalla was imprisoned by the Kenyatta regime after he, in a political pamphlet Kenya: Twendapi? (Kenya: Where Are We Heading To? ), questioned the direction Kenyatta was guiding the country. While in prison, he wrote an anthology of poems that ironically won the 1974 edition of the Jomo Kenyatta Award for Literature, an award named after the very man who had imprisoned. Kimani wa Wanjiru interviewed him. Kymsnet: Prison Literature that delve into the horrid conditions and experiences of writers in prison, forms an important body of art in Kenya and Africa in general. Would you describe it as more than mere writing or do you feel they represent anything? Abdilatif: I think it is more than just writing. Because by writing, such writers- especially those who were imprisoned because of their writing, and while in prison were denied writing materials- are at the same time defying the powers that be and making a very bold statement that there is no way that they can be stopped from expressing their views through writing. In other words, by doing so they continue to resist against the very system, which imprisoned and restricted them. Kymsnet: How important are these writings in describing and capturing a country’s history and development in the political, economic and social paths? Abdilatif: It really depends on how they have been written, and also their background, because not all prison works, in general, do portray those aspects of the society. One could, for example, have written a novel which is purely about love, or a crime thriller for that matter, without any connections to the realities which could be identified with the country in question, but perhaps based on a purely artificial and very imaginary place. However, I think the majority of prison writings are important because, even if such a writer based his work on his personal experiences while in prison or detention, there is no way that he would be able to divorce them from the historical, political, economic and cultural developments of the country. Kymsnet: Kenya has its own generous share of literary material authored behind bars. It can, on the one hand, be closely linked to the democratization of our society and an indicator that even jail has not and cannot dampen the fury of the pen, on the other hand. What are your thoughts? Abdilatif: The prison writings in Kenya, which I am aware of are direct responses to the different political situations in which our country found itself. For example, during the colonial period we had works such as ‘Mau Mau’ Detainee, by JM Kariuki, which, although was not written in prison, did, nevertheless, mainly dwell on the experiences which the author went through from 1953 to 1960 while he was detained by the British colonial government for being a member of the Mau Mau movement. Another one is Mau Mau Author in Detention: An Author’s Detention Diary by Gakaara wa Wanjau. This was originally written in Gikuyu. As the sub-title indicates, this was a diary the author secretly wrote and kept, recording his experiences in different detention camps in Kenya where he was detained for a total of eight years between 1952 and 1960 as a result of his activities in the Mau Mau movement. Another one which is in the same league is Freedom Fighter, by J. Nyamweya. And there are several others. The post-independence period gave us prison works like Sauti ya Dhiki, Ngugi wa Thiong’o’s Detained: A Writer’s Prison Diary and the novel, Devil on the Cross; Alamin Mazrui’s anthology of poems, Chembe cha Moyo, which he wrote when he was detained without trial for more than two years in different Kenyan prisons after his play, Kilio cha Haki (Cry for Justice) was performed at the University of Nairobi; also Maina wa Kinyatti’s Kenya: Prison Notebook and Mother Kenya: Letters From Prison, 1982-1988, both written during his six years’ imprisonment, to mention but a few. One of the intentions and expectations of the jailer is to kill the spirit of the one jailed because of his convictions – especially if those convictions are political. But for the one who strongly holds on to them, prison or detention can never break such a person, but, I dare say, does quite the opposite. Because that which fire cannot burn only makes it harder. And this is manifested in these prison writings wherein you can see how stronger that prisoner or detainee has become and how more convinced he is and more committed to what he believes in, compared to before that person was jailed or detained. Here we have mostly concerned ourselves with those writings which were written within the walls of prisons. But, I think, it is also important to bear in mind that even those works which were written outside the confines of prison cells, but in an environment which was equally oppressive (in a wider prison, so to speak), should also be given a very serious consideration. Kymsnet: The late Wahome Mutahi noted that “For many writers writing about their horrid experiences behind bars is often cathartic, therapeutic, if you may call it.” Do you feel the same? Abdilatif: I quite agree with Mutahi’s observations. At least from my personal experience, one of the things which helped me to keep my sanity in the solitary confinement which I was in throughout the period of my incaceration at Shimo La Tewa Prison and Kamiti Maximum Security Prison, between December 1968 and March 1972, was my writing. My poems gave me company; and, in the process, we communicated with each other and, sometimes, argued with each other! Solitary confinement, as the term itself denotes, is a very lonely kind of life; in fact it has within it elements of mental torture, which are partly designed to break you and kill your resistance and spirit. Just imagine, taking a social being who in his or her previous life before being imprisoned or detained was living among, and interacting with, his or her immediate family members, as well as the larger family of fellow human beings, and then suddenly force that person to live a life of absolute isolation and without even the very minimum of basic necessities of freedom. Now, in such a situation, one really needs to have something to hang on to. Composing my poems was one the three major things which sustained me (the others being not regretting for what I did and caused me to be imprisoned, because I strongly believed that what I did was right and that I would do it again if a similar situation presents itself; and the third was my faith and religious belief that one should never lose hope as long as one can still breathe. Kymsnet: Would you say these literary works have contributed anything in the country and the continent at large? Abdilatif: I am inclined to think so. If nothing else, such works can at least help others who might find themselves in similar situations. Kymsnet: You were imprisoned for 3 years and put in solitary confinement that resulted with the manuscripts of poems that were later on published as Sauti ya Dhiki. What was going on in your mind as you penned the poems later on published as Sauti ya Dhiki? Abdilatif: As I mentioned earlier, writing those poems gave me sustenance, strength and the will to endure what I went through in prison. One of the very valuable things which solitary confinement gave me was the space (however tiny my cell was) and time (plenty of it since I was not allowed even to work, despite the fact that I continuously begged the prison authorities to allow me to do so) for reflection and stock taking. It enabled me to test myself as far as my political convictions and beliefs were concerned. I sometimes jokingly say that I thank the Government that imprisoned me for having given me that opportunity to test my convictions. Therefore, in Sauti ya Dhiki one can find poems in which I keep on reawakening and reaffirming- again and again – my political convictions; also there are political poems which deal with the situation Kenya and Africa were in at that particular time; what I was mentally busy with – sometimes grappling with near uncertainties and doubts; my very personal and emotional feelings, such as longing and worries for the family members I left behind, as well as the torments of loneliness and boredom, which kept reminding me that they will never desert me. There are also poems which deal with matters cultural. Equally, what also occupied my mind was unceasingly thinking about how, once I am out of the prison gates, I will continue with the struggle to bring about meaningful changes in our country. This exercise of composing my poems was comforting to me, but at the same time it was a dangerous undertaking, because in the process I was breaking prison rules and regulations which governed my solitary confinement. One of the restrictions, among many, was not to be allowed any reading or writing material. In other words, I was forbidden to write or read. I must tell you, that was very painful to me – especially the very cruel rule of not being allowed to read, since from the time I could read I have always been very fond indeed of reading whatever I could lay my hands on. Therefore, that restriction was like passing a death sentence to me! So, for the first six months or so of my imprisonment I had absolutely nothing to read! It was after those very long six months, and after several times insistently requesting the Kamiti Senior Superintendent of Prison – whenever he paid me his regular visits to check if the rules of my confinement are duly followed by the prison warders guarding me- to allow me to have something to read, was I finally allowed to have a copy of the Koran, but- and he emphasized on that- only the Arabic version, and not in translation. Little did he know that by allowing me to have only that Arabic version of the Koran he was handing me a very powerful instrument, which helped me a lot in soothing my internal pains and sufferings as well as strengthening my inner resolve even more! Or, maybe, he did know the power of the contents therein, otherwise he would not have insisted that it should not be in translation, thinking that I would not understand it in Arabic). Because in it I met characters in Islamic history, who were tortured to death and others harassed in various ways so that they denounce their newly-found faith, but they never relented; others who were lured to a better life if they would abandon Islam, but they preferred their poor lives in dignity and with their faith intact rather than wealth in humiliation; others who preferred imprisonment rather than “freedom” under subjugation and dictation; and many other similar situations. So, that particular copy of the Koran was more than enough for me. I did not need to request for anything else! However, it was after so many months that I was allowed to have a Kiswahili translation of it, by Sheikh Abdulla Swaleh Farsy, who was then the Chief Kadhi of Kenya. Kymsnet: How did you get started? Abdilatif: The acquisition of writing material was to come after about another six months. It was almost one year since my arrest in December 1968 that I managed to persuade one of my regular prison guards – who had turned to be sympathetic to me because of my politics – to get me a small piece of pencil. God knows how I treasured that! That, together with my weekly ration of rough toilet paper, which proved to be very useful as writing paper! I came to know how toilet papers could be useful in prison as writing material many years before my imprisonment, when I was reading Kwame Nkrumah’s autobiography (who became his country’s first President), which he wrote when he was imprisoned in James Fort Prison in his country, Ghana, by the British colonialists for agitating for his country’s independence. Kymsnet: That must have fired the creative juices in you. How were the first steps like? Abdilatif: Being in possession of these two very important and valuable materials—paper and pencil, I was now ready to start my poetical exploration within the solitary confines of the four walls of my cell at Kamiti Maximum Security Prison. I wrote my very first poem in prison, titled “Nshishiyelo ni Lilo!” (roughly translated it means, “I Hold Fast to What I Believe In”) in September 1969. This particular poem was a sort of a letter to my elder brother, Sheikh Abdilahi Nassir, although at that time I did not have any possibility of sending it to him, because I was not allowed neither to receive nor send letters, even to my immediate family. This brother of mine was the main person who was responsible of my politicization during my teens, and I had promised him that I will never surrender even when I find myself in trouble with the Government. I also kept a diary in a coded language, and wrote a short novel called “Ni Haki Yangu”. After my release, I did not bother to put the finishing touches on the novel. I just lost interest in it. As for the diary, due to the fact that a long time had already passed, I could no longer decipher the codes as I had forgotten most of them. However, there is a very small part indeed which I still could remember, and which I deciphered. It was published under the title “The Right and Might of a Pen”, in the September 1985 issue of Africa Events, a monthly current affairs magazine published in London. Kymsnet: Ironically, the anthology of poems won you the 1974 edition of the Jomo Kenyatta Award for Literature, an award named after the very man who had imprisoned you after you questioned the direction he was guiding the country in the political pamphlet Kenya: Twendapi? (Kenya: Where Are We Heading To?). Did you find this ironical? Abdilatif: Many people, and on many occasions, have asked me that very question. Yes, it sounds ironical. And sometimes it makes me feel uncomfortable to be associated with an Award which bears the name of the person whom I strongly feel had betrayed Kenya as a whole, and betrayed me personally. I say he betrayed me personally, because since the days when I was in primary school, when Kenya was still under British colonial rule, I used to regard Mzee Jomo Kenyatta as one of my heroes. For example, during those days the school day started with all the pupils assembling at the school courtyard and singing the British anthem, “God Save the Queen”, before they entered their respective classrooms. I remember how when I was attending primary school in a village called Takaungu I used to secretly and whisperingly substitute the word “Queen” with “Kenyatta” because I believed that he deserved that prayer more due to the fact that he was fighting for the rights of our country and its people. (There was only one student friend who knew about this “subversive and seditious” act of mine and, thank God, he never betrayed me to the school authorities). Now, when I answer this question I always emphasize that although that Award was named after Kenyatta, he had nothing else to do with it. This Award was the brainchild of Kenya Publishers Association, which also made the money for the Award available. How it came that Sauti ya Dhiki came to win it, or who the judges who decided so were/is still a mystery to me. Kymsnet: You published Kenya: Twendapi? (Kenya: Where Are We Heading To?) close to 41 years ago. What are the circumstances that led to your publishing this pamphlet? Abdilatif: Kenya: Twendapi? was the seventh in the series of occasional pamphlets I used to write, in consultation and cooperation with my political comrades, and which were clandestinely distributed. They were signed “Wasiotosheka.” This was the term which the first President, Mzee Jomo Kenyatta, used in his public rallies to refer to us who were not satisfied with the situation in the country and who were opposed to the way the country was being governed. That is, we were “the disgruntled” or “the dissidents”, as the government used to call us. Now, allow me, please, to put the reason of writing and distributing this pamphlet into context. When this pamphlet was written I was 22 years old. But from the age of 19 years I was a member of the then opposition party, Kenya Peoples Union (popularly known as KPU), which was led by Jaramogi Oginga Odinga. At that time I had just started my second year as an Accounts Clerk at the Municipal Council of Mombasa. KPU was legally formed and registered by the government as a political party in 1966. As you will see, this was just three years after Kenya attained its independence. The formation of KPU was necessitated by the fact that about two years after independence some of those who were in power (and it was a very powerful and very ruthless small group) had already started to divert from the path which Kenyans had charted during the independence struggle, and which was enshrined in the KANU Manifesto of 1963, which was a relatively radical document. Greed, which was manifested by this group through the amassing of wealth, mostly by foul and unjust means, and the unashamedly grabbing of land by the ruling class, was already in full swing. The rot had already set in. The government had also started to be intolerant of any opposing views, and did not want to listen even to its own members of government who saw things differently, and who offered suggestions on how things should be put right and, in the process, return to the path agreed upon while fighting for independence. In short this group was very arrogant and was behaving very badly indeed. They behaved as if the country was their personal property, and they did not have any qualms whatsoever! Some of those who did not agree with the situation we then had in the country were the then country’s first Vice President, Jaramogi Oginga Odinga, who was also the Minister for Internal Affairs. Others were Bildad Kaggia, who had by then already resigned as an Assistant Minister of Education (but remained in KANU) because of his disagreement with the Government’s policies, especially regarding the land issue; Achieng Oneko, then Minister of Information, and Tom Okello Odongo, then an Assistant Minister for Finance, to name but a few, and several other nationalist figures. These patriots, when they saw that things were starting to go wrong, they first tried to change things from within. But after a while they realised that they were not – and will not – get anywhere. Hence the formation of KPU as the alternative. When these patriots left the government and the ruling party, KANU, to join KPU, the regime rushed a new law through parliament, which was subsequently passed. This new law made it mandatory for any sitting Member of Parliament who resigned from the party which made it possible for him or her to be elected as an MP, to seek re-election. As a result, all those who “crossed the floor,” to use the parliamentary jargon, had to go back to their respective electorate to seek new mandate. The real purpose for the Government to introduce this law was to threaten and stop other KANU Members of Parliament who also wanted to join KPU from doing so. In the ensuing by-elections (which were dubbed by the media as “the little general election),” – and despite the restrictions placed by the Government in order to make KPU’s campaign near impossible, KPU garnered nine seats. Within a short period, KPU became popular with the ordinary masses across the country. But there were also pockets of resistance against it among some elites in some communities, especially from the Central Province, but also from other areas. This opposition, in my opinion, stemmed mainly from two factors: The first one was due to independence euphoria: the argument which gained currency was that the government was only three years old and, therefore, some people were of the opinion that it was too early to paint it with a negative brush. They felt that it should be given more time to find its bearings. I vividly remember the difficulties some of us had during those days when trying to persuade such people that if things were not nibbed in the bud there and then, once this beast of a government grows fatter and stronger, it would overwhelm all of us and make it more difficult to bring about the required changes. The second factor was based on this cancer which continues to eat and destroy the very body of our country, namely what Koigi wa Wamwere rightly calls “negative ethnicity.” This “negative ethnicity” was nurtured and perpetuated after independence, mainly by those who wielded the reins of power. And, as is apparent today all over the continent of Africa, the genesis of “negative ethnicity” is the unequal distribution of the national wealth and resources. Jomo Kenyatta and his cabal were masters of this deadly game. It is no secret that certain selected communities benefitted from this at the great expense of the big majority of other Kenyans. Therefore, those who were beneficiaries of this unfair system were hostile to KPU, whose policies were based on social justice. When KPU’s support among the Kenyan masses grew stronger, all the government’s radars read “danger”! It subsequently started to restrict its activities and harass and detain its leaders and its prominent supporters. And the Government’s naked intolerance and repression against KPU was to become more evident during the Local Government Elections, which took place in August 1968. In those elections, KPU fielded candidates across the country. In all, there were about 1,800 KPU candidates. Definitely, this was going to be the first big opportunity to electorally test the popularity or otherwise of these two sides: the ruling party, KANU, on one side and the first opposition party in independent Kenya, KPU. But for some months before, there had already been indications that the Government had become unpopular among the people. The signs were clearly on the wall for all to see: that the government would lose these Local Government Elections. And the KANU Government didn’t have the courage to let the Kenyan people exercise their constitutional right to choose between the two sides. What it instead did was to instruct the retuning officers all over the country to disqualify all the KPU nomination papers. And, you know, what was the reason given by the Government for those disqualifications? That all the KPU nomination papers were not correctly filled in!! Not even a single one? Now, this reason could not be accepted even by the silliest of persons. In my opinion, the seeds of dictatorship in Kenya, which came to devour the very soul of this country for so many years after, were sown during that period. Something had to be done against this very dangerous tendency. At the very least to speak out against it. So I made it the topic of the next pamphlet, Kenya: Twendapi? In short, in it I argued- and I must admit – in a very angry and fiery language, that by behaving the way it did, the Government had robbed the Kenyan people their constitutional right of peacefully and democratically electing their leaders. I also said that if it behaved in the same dictatorial manner in the 1970 General Elections, then the only alternative for the people of Kenya would be to rise up and remove the Government by force! Kymsnet: That must have rubbed some people the wrong way. Kenya Twendapi? Is this still a relevant question to date? Abdilatif: You ask me whether the question, Kenya: Twendapi? is still relevant to-date, and whether the issues raised therein have been adequately addressed, more than 40 years later. My very brief answer is that I would like to believe that the question is still very relevant, because I think as a nation, we have not yet sat down to seriously and thoroughly discuss what kind of country we would like Kenya to be, and also have the courage to take practical steps to bring about the structural changes needed. I know that we had the Bomas and also other several conferences have been held on this theme; but, in my opinion, those were more for public gallery in order to make Kenyans believe that attempts are being made to improve their situations. But, in actual fact, nothing concrete has been achieved from such gatherings. Instead we have only had some cosmetic changes. Because the real changes required in order to turn round the prevalent situation go against the very interests of the ruling class. Kenyans should not trust their future into the hands of this group. A lot of organisational and awareness work still needs to be done so that ordinary Kenyans themselves can determine their own future. Kymsnet: The government took Kenya Twendapi? negatively and led to your imprisonment. How was the publication taken by your family? Abdilatif: The only member of the family who was aware of my writing of the pamphlets was my elder brother and mentor I mentioned earlier, Sheikh Abdilahi Nassir. He is the one who, during my teens, initially sharpened my political awareness by taking me along to his political public rallies. He was among the founder members of KANU at Limuru in 1960, and later he was among the leaders of the struggle for Mwambao, the 10-mile Coastal Strip, when the Coastal people felt that they had been short-changed by some KANU leaders and were being regarded as foreigners in their own country. He also used to give me political books to read. Among the books which he gave me (and I vividly remember his insisting that I should read it seriously) was History Will Absolve Me, by Cuba’s Fidel Castro. This book, which was Fidel Castro’s defence in court when he, together with his comrades, were facing charges of attempting to overthrow by force the Cuba’s government, then led by Batista, was instrumental into formulating my radical politics. Kymsnet: Did you share the content of the article with your family members before you published it? Abdilatif: I remember showing him the draft of the pamphlet, Kenya: Twendapi? His comment was that the tone and the diction used was very harsh, and he advised me to tone down the language. My stubbornness took the hold of me and I declined to do so. I was so angry with the Government’s intransigence and dictatorial and arrogant behaviour that I did not want to dilute the expression of how I really felt. One of the things which I very much appreciated, and still do, of this brother of mine was that he never imposed his views on me, but always allowed me to follow my ideas and beliefs, even if we did not see things eye to eye- as long as I was strongly convinced in what I believed. That is how he brought me up as far as views and ideas were concerned. And I thank him so much for letting me independently choose the path I wanted to travel on, and at the same time always reminding me to be cognizant of the likely result of my actions and to be ready to accept whatever fate will befall me as a result. Kymsnet: Did you think it would lead to your imprisonment? Abdilatif: As for the thought that imprisonment was a likely possibility, yes, that I knew might be one of the prices I would have to pay. In fact, in my own idealistic way, I was prepared for anything even worse than that. For during the period I was writing the pamphlets prior to Kenya: Twendapi?, I received several verbal warnings from Government authorities that I should stop. 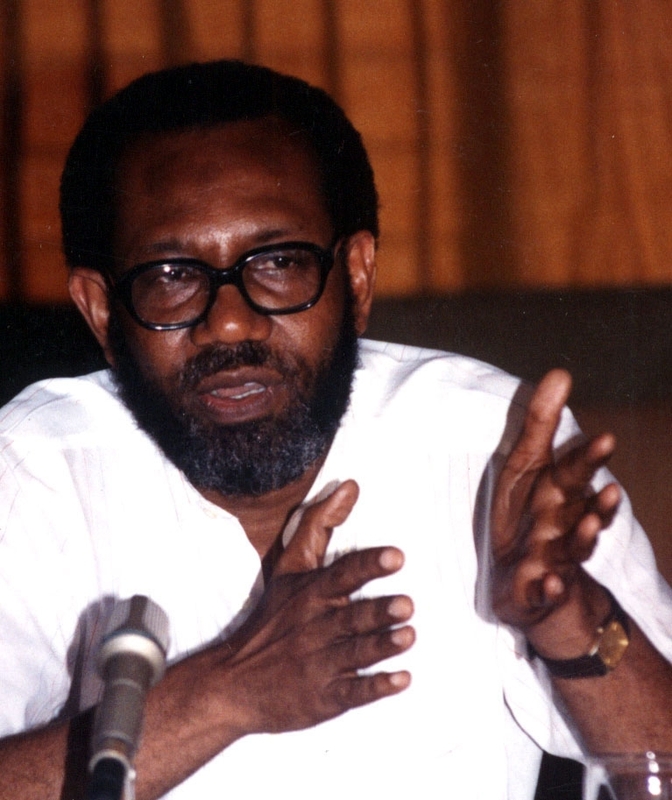 Among them was the then Mayor of Mombasa, the late Abdalla Mwidau; the then Old Town Chief, the late Sheikh Mohamed Fadhiluna, and the then Coast Provincial Commissioner, the late Isaac Mathenge. And to them all, the answer was the same: Defiance! Kymsnet: How can you describe yourself? Who would you say is Abdilatif? Abdilatif: The Greek philosopher, Socrates, was fond of saying, “Know yourself.” But he is also reported to have said- and I am paraphrasing him here- that knowing does not stem from knowledge per se but from the realization that, in the first place, you know nothing. I wished I knew who Abdilatif was! That is a very difficult question for me to answer. I would like to believe that other people know better who Abdilatif is rather than Abdilatif himself. So, leave that question to them. Kymsnet: Take me through the journey of your life— When & Where were you born? Are you the eldest or last born? How many are you in the family? Abdilatif: I was born in the Old Town part of Mombasa, in an area called Kuze, on the 14th of April, 1946. I am the third in the rank, sandwiched between my two elder brothers, Sheikh Abdilahi Nassir and Ahmad Nassir Juma Bhalo and my younger brother, Khalid Khamis and younger sister, Swafia Khamis. As you would see from their full names, I am a brother to all of them on the maternal side. Kymsnet: Where did you go to school? What are some of the memorable thoughts of your life while you were growing up? Abdilatif: I started my primary school education in Faza (also called Rasini), where my great uncle, Ahmad Basheikh, who- together with his wife, Bibi Sharifa Haji Fadhil, raised me since I was three years of age – had been transferred to teach at Faza Primary School. This was, and still is, a small village in the northern-most part of the Kenya Coast, a place which could be accessed only by sea. The town which is nearest to it, and which is more famous, is Lamu. But it was at Takaungu, where my great uncle, who was also a poet, was later transferred that I received most of primary education. In fact I did my Kenya Primary Education (KPE) there. And, to my very big surprise, I failed it! After that I did not continue with formal education. I just read books!!! Kymsnet: What did you want to do in life? Did you want to be in the academia? Abdilatif: I can’t remember of having had any concrete career ambitions as such, especially after having failed the final primary school examination and not pursuing formal education any further. However, this elder brother of mine, Sheikh Abdilahi Nassir, had wanted me to be a lawyer, and had enrolled me for a correspondence course so that after achieving the required qualifications I could ultimately pursue a degree course in Law. But in those early days of my life, this profession was not very tempting to me, although I knew that if one were successful, one could earn a lot of money. I used to regard Law as a bourgeoisie profession, and I held a belief that lawyers’ main motive was just to make loads of money at the expense of other peoples’ problems. For example, I just could not convince myself on the fairness of the system that one had to pay a fortune to a lawyer in order to be represented and defended, when the legal system should have been designed in a simple way that one could be able to defend oneself and in a language the defendant understood, without the intervention of a third party. And life in the academia was not at all on my agenda for my future. I didn’t even imagine or dream that I would one day end up in it! Kymsnet: What prompted you to choose your career in the academia? Abdilatif: I don’t think that I consciously chose it. It was due to the mixture of the then prevailing circumstances that I found myself there. My first academic post was at the Institute of Kiswahili Research, University of Dar es Salaam. In about July of 1972, I was made aware of the existence of a vacancy for an Assistant Research Fellow in that institution, and I was advised to apply. That, to me, was a Godsend! I had been released from prison four months before, and had not yet even started to think about whether it would be possible for me to be employed, especially due to the nature of my “offence”, which landed me in prison in the first place. In those days if you were known to have fallen on the wrong side of the then Government, you ended up in a black list and you were regarded by the employers as unemployable. So, I applied for it, went to Dar es Salaam for the interview, and was awarded it. I joined as an Assistant Research Fellow, and after a short while I was duly promoted to a Research Fellow position, and later to a Senior Research Fellow. I worked at that Institute for the maximum seven years the Tanzanian law could allow a non-citizen to do so. Near the expiry of my seven years, I was persuaded by the authorities to take Tanzanian citizenship in order to continue working with the Institute, but I could not let myself lose my Kenyan citizenship. That would have been very painful indeed for me! After seven years in Tanzania, I left for London where I had gotten a job with the Kiswahili Service of the British Broadcasting Corporation (BBC), where I also worked for seven years as a broadcaster. From electronic media I moved to print media in 1986, when for the next eight years I worked as Editor-in-Chief of a monthly current affairs magazine, Africa Events, which was published in London. And from there, I taught Kiswahili at School of Oriental and African Studies (SOAS), University of London, till 1995, when I left for Germany, where I had been offered a post at Leipzig University as Lecturer for Kiswahili Language and Literature. Kymsnet: You have since published other works. Please give me an outline of the body of your works of art – the things that you have done – both in Africa and internationally. Kymsnet: Which one was the most challenging and why? Which one do you think is the lousiest and why? Abdilatif: I can easily say that I regard Sauti ya Dhiki to be my most challenging and rewarding work. Challenging because of the circumstances in which it was written, as well as the opinions and feelings expressed therein. Rewarding because of the way it was received by the reading public, and continues to be received even though 36 years have now passed since it was first published. There isn’t any which I regard as the lousiest. Kymsnet: Where do you draw inspiration for your works of art? Who was your role model in the industry? Abdilatif: My inspiration comes mainly from the surroundings and the environment I am in. My main influence and role model as far as my poetry is concerned, are the two people I mentioned earlier, namely my great uncle, Ahmad Basheikh (who used to give me his poems to read before he went to recite them at Sauti ya Mvita, the radio station which existed in Mombasa till mid-1960s), and my elder brother, Ahmad Nassir bin Juma Bhalo, who is a major Kiswahili poet. I was also very much influenced by the poetry of the 19th century Mombasan poet, Muyaka bin Haji, who lived between 1776 and 1840. Kymsnet: Please give me some highlights of: your happiest moments/memorable time; your trying/challenging time. I must say that the period I spent at the Institute and the Dar es Salaam University in particular (which in the 1970s was Africa’s hotbed of revolutionary ideas), and my entire living period in Tanzania in general, was one of the happiest, most satisfying and most memorable periods of my life. Not only that I was living in a country whose then President, Mwalimu Julius Kambarage Nyerere, was one of the political thinkers who had a great influence on me, but also because Tanzanians received as one of their own. My most trying and painful times were the years I lived in exile, especially after moving to London, without being able to go back home because of fear of being arrested due to the campaign me and my fellow Kenyans (namely, Ngugi wa Thiong’o, Yusuf Hassan, the late Wanjiru Kihoro, Shiraz Durrani, Wangoi wa Goro and Nish Matenjwa) were waging against the KANU and Moi Government, after the intensification of repression in the wake of the 1982 military coup attempt, when scores of people were killed by Government agents, many were arrested and imprisoned, others were made to disappear without a trace, and many more Kenyans had to flee the country and seek refuge in foreign countries. We had started our activities in London by first forming the Committee for the Release of Political Prisoners in Kenya, with branches in several European and African countries, as well as in the USA; thereafter we formed the externally-based political party by the name of Umoja wa Kupigania Demokrasia Kenya (United Movement for Democracy in Kenya), again with branches in those other parts of the world; and also because of my involvement in the underground movement, MWAKENYA (Muungano wa Wazalendo wa Kuikomboa Kenya). Kymsnet: What are the other things that you like doing when you are not working? What are your hobbies etc.? Abdilatif: Reading is my most favourite hobby. Then comes listening to good music, and going to classical music or jazz concerts. I also like travelling to new places. it. You are making it entertaining and you still take care of to keep it sensible. Man, this is marvelous work. I salute you brother; as u put it “you are talking culture and arts” in a very rare sense of creativity- actvism in the loop. Kimanthi, thanks bro for the compliments and taking time to read the interview. I will try to keep them coming and may you continue to find them appealing. Can you please put me in touch with Mashengu wa Mwachofi? I did some research in Korogocho with him in 1998 and live in a different part of the world now. I think he is an excellent scholar and a great teacher! Kym this is a very good and useful piece of work! Please keep it up!